Annette Dowd is a physicist who joined UTS in 2003. Her research interests are in the area of development optical and structural characterisation techniques for nanostructured materials. In particular, in her time at UTS she has published on topics such as vibrational spectroscopic techniques for analysing biological specimens, novel plasmonic materials, x-ray diffraction techniques for studying oxide nanoparticles and terahertz spectroscopy for understanding semiconductors and molecules. Annette Dowd obtained her BSc in Medical Physics from the University of New South Wales. 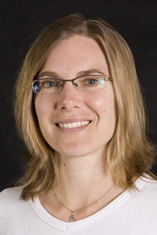 She moved to the Australian National University and was awarded her PhD in Physical Sciences in 2002, which was focused on the nonlinear optical properties of semiconductor nanostructures. She worked as a post-doctoral associate in the Cavendish Laboratory at the University of Cambridge developing compact terahertz emitters and detectors using semiconductor optics. Co-chaired 2014 Australasian Conference on Vibrational Spectroscopy/Asian Spectroscopy Conference, held in University of Sydney. Synchrotron techniques (Powder Diffraction, Far IR/Terahertz, Xray Fluorescence Microscopy) for biology and materials. A hybrid surfactant/polyoxometalate compound was synthesized by combining isopolytungstate anions with the cationic surfactant cetyltrimethylammonium bromide (CTA-Br) to produce a hierarchical compound that we identify as (CTA)7[H2W12O40]Cl·2H2O. At room temperature the compound consisted of hexagonally ordered sheets of Keggin ions, with an intervening gallery containing alkyl-chains of the organic cations. The synthesis was highly dependent on solution pH, reaction time and the order in which the reactants were added. We examined the effect of temperature on the stability of (CTA)7[H2W12O40]Cl·2H2O using thermal gravimetric analysis, differential scanning calorimetry, FT-IR spectroscopy and in situ synchrotron X-ray diffraction, and found a step-wise conversion to monoclinic WOxvia a series of intermediates. Heating under nitrogen atmospheres accelerated transition events by 100 °C when compared to heating in air. During heating, the interplanar gallery at first expanded in a series of steps starting at 90 °C as the CTA+ amphiphiles changed orientation, before collapsing rapidly at 240 °C, a temperature coinciding with the removal of about 40% of the organic material. Between 240 and 320 °C, the material consisted of fragments of the Keggin ion cores, arranged in 2D hexagonally-packed sheets. At 330 °C, the Keggin ions were completely destroyed and replaced by bulk W17O47 which, upon further heating, transformed to bulk WO2 or WO3 depending on the environment. © The Royal Society of Chemistry.The enhancement of a Raman signal by multipolar plasmon resonances-as opposed to the more common practice of using dipolar resonances-is investigated. A wide range of gold stars, triangles, circles and squares with multipolar resonances in the visible region were designed and then produced by electron beam lithography. We used 633 nm excitation and Rhodamine 6G as a probe molecule to confirm that, although the dipolar resonances of these shapes lie well into the infrared, SERS in the visible can still be obtained by coupling to their 'dark mode' multipolar resonances. However, the magnitude of enhancement in any given shape varied significantly and stochastically. Electromagnetic simulations were used to probe this surprising phenomenon further. These revealed that the presence or absence of a multipolar plasmon resonance at an particular excitation wavelength depended critically on the size and symmetry of the shape being examined, with a good SERS response only possible if the peak of the multipolar resonance is aligned with the 633 nm laser excitation. Peptides based on unnatural 3-amino acids offer a versatile platform for the design of self-assembling nanostructures due to the folding stability of the 14-helix and the high symmetry of the side chains inherent in this geometry. We have previously described that N-terminal acetylation (Ac-) forms a supramolecular self-assembly motif that allows 3-peptides to assemble head-to-tail into a helical nanorod which then further bundles into hierarchical superstructures. Here we investigate the effect of the topography of the 14-helical nanorod on lateral self-assembly. Specifically, we report on the variations in the superstructure of three isomeric peptides comprising the same three 3-amino acid residues: 3-leucine (L), 3-isoleucine (I) 3-alanine (A) to give peptides Ac-3[LIA], Ac-3[IAL] and Ac-3[ALI]. AFM imaging shows markedly different superstructures for the three peptides. Well defined synchrotron far-infrared spectra reveal uniform geometries with a high degree of similarity between the isomeric peptides in the amide modes of the 400–650 wavenumber range. Far-IR also confirms that the C-terminal carboxyl group is free in the assemblies, thus it is solvated in the dispersant. Hence, the differences in the superstructures formed by the fibers are defined primarily by van der Waals energy minimization between the varied cross sectional morphologies of the core nanorods. Potassium-rich titanate nanofibers were produced by digesting TiO2 in concentrated KOH solutions under hydrothermal conditions. The nanofibers were characterized by scanning electron microscopy, energy dispersive X-ray spectroscopy, X-ray diffraction, and thermogravimetric analysis. A hexatitanate structure was assigned, in contrast to the trititanate structure usually resulting from NaOH treatment of TiO2. The potassium cations could be exchanged with others, such as sodium, hydrogen, and ammonium. The potassium-rich hexatitanate was found to be photocatalytic in its as-synthesized condition. The thermal stability of the fibers during calcination was followed in situ using X-ray diffraction and was found to be strongly dependent on the chemical composition. The potassium-rich titanate converted to anatase at only 480 °C, whereas the hydrogen- and ammonium-rich materials had to be heated to over 600 °C before conversion took place. Conversion was notably slowest in the ammonium-rich material. Surprisingly, the sodium-rich hexatitanate did not form anatase at temperatures up to 800 °C and instead recrystallized. A sensor for characterising aqueous solutions of hydrogen peroxide is described. The sensor is based on the calorimetric signal obtained when catalysing the decomposition of H(2)O(2). The system is quick and simple, and is suitable for determinations of H(2)O(2) concentration between 0% and at least 50% (w/w). Despite Au, Al and Cu being individually very well-known elements, their ternary phase diagram has not been studied in as much detail as those of many other Au-containing ternaries. Here we review what is known, and consider the prospects for technological exploitation of some of the ternary compositions. The components of greatest interest in Al-Au-Cu may be the P-phases, at least two of which have shape memory properties. Of these, 'Spangold', which has the nominal stoichiometry Au7Cu5Al4, has received some attention for jewellery applications, while the edge compound Cu3Al is a well-known shape memory composition with corresponding specialised industrial uses. The properties of other beta-phase compositions in the system have been scarcely investigated. The system also contains an extensive gamma-phase, Al4AuxCu9-x, where x ranges from 0 to similar to 6.5, and the purple gold phase AuAl2. It is shown experimentally that surface-field terahertz (THz) emitters can produce well-collimated beams of THz radiation, making them useful devices for time-domain spectroscopy applications. Simulations of the carrier-dynamics are used to explain the mechanism of THz generation in InAs and GaAs, and it is shown that inter-valley scattering of electrons must be considered in order to fully describe THz emission from InAs. We discuss the origins of the magnetic-field-induced enhancement of terahertz (THz) emission from bulk semiconductor surfaces. The principal effect of the magnetic field is to rotate the THz dipole and hence dramatically increase the THz power radiated through the semiconductor surface. It also significantly affects the ability of the photo-created carriers to screen surface electric fields. The sensitivity of THz emission to the motion of photo-created carriers makes this an ideal probe of hot carrier dynamics both in bulk semiconductors and sophisticated heterostructures. A compact, high-power emitter of half-cycle terahertz (THz) radiation is demonstrated. The device consists of an epitaxial InAs emitter upon a GaAs prism and produces THz pulses that are 20 times more powerful than those from conventional planar InAs emitters. This improvement is a direct result of reorienting the transient THz dipole such that its axis is not perpendicular to the emitting surface. (C) 2002 Optical Society of America. Ge nanocrystals formed in silica by implantation with 1.0 MeV Ge ions and subsequent annealing at 1100Â°C were characterised by transmission electron microscopy and Raman spectroscopy. The nanocrystals were found to be approximately spherical in shape and to have a structure consistent with that of bulk Ge. The average size of the crystallites increased with increasing fluence and for a fluence of 1Ã1017 Ge cmâ2 the size varied from 2.5 to 12 nm. The nonlinear optical response of the material was measured at a wavelength of 800 nm using degenerative four wave mixing and z-scan techniques. The former provided information about the magnitude and temporal response of the nonlinearity whilst the latter provided information about the operative mechanism. The magnitude of the nonlinear refractive index, |n2|, was shown to be more than three-orders of magnitude larger than that of pure silica and to have a relaxation time of the order of picoseconds. The mechanism causing this nonlinear response is shown to be absorptive and to increase with increasing implant fluence as a consequence. The absorption and extinction spectra of Ge nanocrystals in silica formed by ion implantation are studied using photothermal deflection and transmission spectroscopies. It is found that scattering makes a significant contribution to the extinction spectrum, damping the spectral features and resulting in a Rayleigh scattering-like omega4 dependence. In contrast, the spectra measured by photothermal deflection clearly show features such as the E1/E1 + Delta1 transitions. The Tauc gap is extracted to be ~0.7Â±0.1 eV. Dowd, A, Smith, J & Wolfe, J 1996, 'Real time, non-invasive measurements of vocal tract resonances: Application to speech training', Acoustics Australia, vol. 24, no. 2, pp. 53-60. This study reports the determination in real time of the frequencies of the first two resonances of the human vocal tract from measurements of the acoustic impedance spectrum of the tract in parallel with the external field. The measurements were made using a broad band, frequency-independent acoustic current source, a microphone and a spectrum analyser which displays the acoustic impedance spectrum. The display provided real-time, visual feedback whereby subjects learned to imitate target vowel sounds without hearing them. Inexperienced subjects who used this feedback produced sounds that were approximately as well recognised as those produced by the same subjects imitating target vowel sounds after listening to them. The recognition rate improves with the subjects' experience in using the impedance feedback technique. This non-invasive technique could thus have possible applications in speech training and language teaching. Silver is considered as one of the most desirable materials for plasmonic devices due to it having low loss, low epsilon2, across the visible spectrum. In addition, silver nanotriangles can self-assemble into complex structures that can include tip-totip or base-to-base arrangements. While the optical properties of tip-to-tip dimers of nanotriangles have been quite intensively studied, the geometric inverse, the base-to-base configuration, has received much less attention. Here we report the results of a computational study of the optical response of this latter configuration. Calculations were performed using the discrete dipole approximation. The effect of gap size and substrate are considered. The results indicate that the base-to-base configuration can sustain a strong coupled dipole and various multimode resonances. The pairing of the parallel triangle edges produces a strongly capacitive configuration and very intense electric fields over an extended volume of space. Therefore, the base-to-base configuration could be suitable for a range of plasmonic applications that require a strong and uniform concentration of electric field. Examples include refractometeric sensing or metal-enhanced fluorescence. Nanotriangles of silver may be readily synthesized by wet chemical techniques and exhibit a strong localized surface plasmon resonance with light. Here we examine the complex resonances of nanotriangles in double-and triple-decker sandwich configurations. Supansomboon, S, Dowd, AR, van der Lingen, E, Keast, V & Cortie, M 2013, 'Coatings of coloured intermetallic compound for decorative and technological applications', Materials Forum, Materials innovation in surface engineering, Institute of Materials Engineering Australasia, Adelaide, SA. (PVD) can be used to form pure, thin film coatings by co-sputtering of the elements. The chemical compositions, X- ray diffraction patterns, microstructures and reflectance spectra of the nanoscale films are compared to those of bulk samples that had been produced by vacuum arc furnace melting. A range of colours can be obtained if the thickness of the films is varied. Simulated and measured reflectance and transmittance data of coloured nanoscale films are compared and the CIE chromaticity indices (a* and b*) of films of various thicknesses determined. This paper presents the design and mathematical modeling of thermal radiator panels to be used primarily to measure night sky radiation from dry and wet coated surfaces. Three panels may be used in conjunction as a combined measuring system. One panel consists of an upper dry surface coated aluminum sheet laminated to an ethylene vinyl acetate foam backing block having a pattern of parallel flow water channels and header channels milled into its mating surface prior to lamination to the aluminum sheet. This configuration provides a fin and channel radiator instrument whereby circulating water may be used to measure the heat loss from this panel to night sky radiation. In a second configuration, the surface of a panel without buried water channels but otherwise identical may be wetted in order to study and compare the night sky radiation from its wet surface. In this case, the measuring water is circulated over the upper face of this panel. In a third configuration, water is sprayed onto the surface of the second panel (or a similar panel) so that an evaporative cooling effect is gained in addition to the radiation effect. Initial TRNSYS simulations for the performance of all three configurations are presented and it is planned to use the panels as calibrated instruments for discriminating between the cooling effects of night sky radiation and evaporation. Copyright © 2012 by ASME. Dowd, A.R. 2008, 'Optical and Structural Characterisation of Vanadium Dioxide Thin Films and Nanoparticles for Novel Optical Applications. ', IUMRS-ICEM 2008 | COMMAD 2008, A-MRS, Sydney, Australia. Dowd, A.R. & Armstrong, N.G. 2008, 'Optimised presentation of nanoparticle size analysis data using Bayesian methods', Proceedings of the ACMM-20 and IUMAS-IV, 20th Australian Conference on Microscopy and Microanalysis, Australian Microscopy and Microanalysis Society Inc, Perth WA, pp. 355-355. The techniques used to identify nanoparticle size and shape characteristics are o vital importance in the developemnt of functional nanoparticles. Each technique offers different advantages: this work compares the two techniques of transmission electron microscopy (TEM) and x-ray diffraction (XRD) analysis by charactering CeO2 nanoparticle specimens. Whole Powder Pattern Modelling (WPPM) is used to quantify the specimens dislocations and size characteristics from XRD data. Using admixed samples we test and extend the techniques. We show that XRD accurately characterises small crystallite distributions and that larger crystallite distributions necessitate further investigation. A Bayesian/Maximum entropy (MaxEnt) emthod is applied to quantify the broadening of X-ray line profiles in terms of the nanocrystallite size effects in ceria. The analysis is in general agreemetn with transmission electron microscopy results, while demonstrating the importance of appropriate a priori information needed in the method. The analysis also identifies other microstructural effects, such as the presence of dislocations and shape anisotropic effects which may be influencing the size distributions determined from the Bayesian/Max-Ent method. Johnston, MB, Dowd, AR, Whittaker, DM, Corchia, A, Davies, AG & Linfield, EH 2002, 'Enhancement of THz emission from semiconductor surfaces', THz 2002. 2002 IEEE Tenth International Conference on Terahertz Electronics Proceedings (Cat. No.02EX621), Terra, IEEE, Cambridge, UK, pp. 48-51. Dowd, AR, Llewellyn, D, Fitz Gerald, JD & Elliman, RG 2001, 'The size distribution of Ge nanocrystals in implanted and annealed silica', Materials Research Society Symposium - Proceedings. This study examines the effect of implantation and annealing parameters on the formation of Ge crystallites in ion-implanted silica. Samples were implanted at room temperature or -196°C with 1.0 MeV Ge+ ions to fluences in the range from 0.6 to 3×1017 Ge.cm-2. Ge nanocrystals were not observed in samples implanted at -196°C but were observed in samples irradiated at room temperature. Nanocrystals were observed in all samples after annealing and their size distribution was found to be almost independent of the implant fluence. The distributions were also shown to be asymmetrical with depth, with smaller nanocrystals located on the near-surface side of the implant distribution. Elliman, RG, LutherDavies, B, Samoc, M & Dowd, A 1997, 'Non-linear optical response of metallic and semiconducting nanocrystals in fused silica', MATERIALS MODIFICATION AND SYNTHESIS BY ION BEAM PROCESSING, pp. 423-428.